The little purple dragon is back at it again reliving his glory days with a fully reworked remaster, built from the ground up. Toys For Bob are behind the re-imagining of the Insomniac trilogy from the 90s and with the success of the recently popular Crash Bandicoot game, we fly in to see what Activision has brought to the table. The Reignited Trilogy includes the 3 originals: Spyro The Dragon, Spyro: Ripto’s Rage and Spyro: Year of the Dragon. The overhaul of the game is voiced by the original Spyro voice actor Tom Kenny. Kenny, who originally took the reigns on Spyro 2, this time, also brings his voice to the revamped first game of the trilogy. The first thing you feel when loading into the title screen is pure nostalgia for the older fans and a sense of excitement that new players will surely get. The main selling point for any game of this nature is the vast improvement of graphics and feel of the game, and Spyro is no exception. Built on Epic’s tried and tested Unreal Engine, the graphics are impeccably well presented. Bright and colourful, it is a sheer joy to run and glide around the original locations of the games, and the redesign of Spyro himself is minimalistic and doesn’t take too much away from the original character. The movement of Spyro is a much noticeable and much better experience, and the way the camera moves about with the analogue sticks gives for exceptionally better Spyro gameplay. The feisty little dragon moves, glides and runs along with the same momentum as before, but the difference is in the detail. The way Spyro’s tail swings as he runs, the way his wings soar through the wind as he glides – small improvements which make all the difference. As Toys For Bob did not have access to the game files and codes for the original games, the developing team used to a special system, in which software was used to record and copy information as the original PS1 games were played through; the effort put in was incredible. It really shows how much these developers truly cared for the franchise – the amount of love put in went into every detail of the game. The smallest details were carefully sought out and recreated from scratch to be included in the game. The story is completely unchanged, so anyone who has played the original will find the exact same locations, dragons and music score throughout the game. Even though the characters are the same, they are improved within the current gen consoles – giving a greater amount of depth to each dragon you rescue. 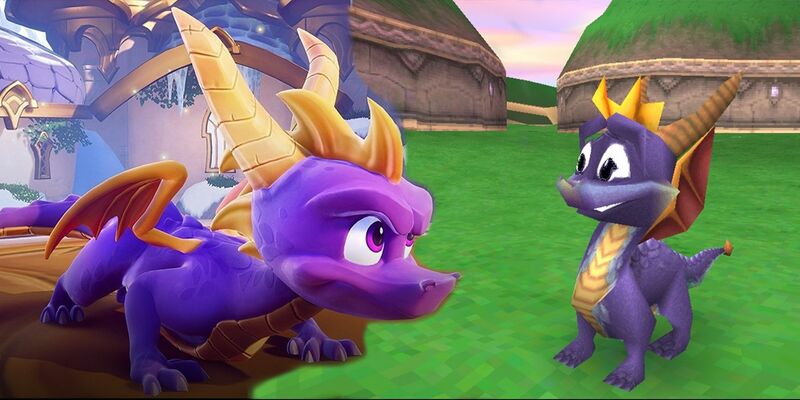 Any creature you meet within the Reignited Trilogy is much more unique and full of life compared to the originals. Enemies you encounter still play the same with certain tactics and whether you defeat them will depend on how you go about combat. Difficulty levels will remain largely the same to the originals, but with some bosses being suspiciously easy to defeat – sometimes you’ll even defeat them accidentally. Spyro must be one mighty little dragon. Little, new improvements and additions are a nice way to spruce up the game without overloading and taking anything away from what we loved all those years ago. Being able to access the guidebook from the first game is very much welcome – unlocking concept art through skill points in the guidebook adds to the nostalgia and furthers the amount of dedication put in by the design team. All the puzzles and secret hideouts are still there and still as fun as ever. Insomniac only went in with the ambition and intent to beef up the graphics and handling and we can see where they’ve kept original plans intact. The side challenges are all much the same, so if you struggled with them then, you’re gunna remain frustrated with them some time on. Fast travel tools are also implemented within the guidebook, so if you get too stuck into the rescuing, rest assured you can go back and claim side challenge gems easily in the future. Considering how fun, colourful and gorgeous the look of the game is, it is only half of the winning recipe, with the other half being provided in the modernised soundtrack scored by Stewart Copeland. Toys For Bob decided to keep the original melodies and sounds of the original, but beef them up with a wider range of instrumentation. You can pop into the settings menu and flick between the old and new score, but I rarely decided to do so. The team did an impressive job with the reimagined soundtrack, which in my eyes, fits perfectly within its new graphical skin. Revisiting the iconic platformer was a pure delight and joy to play through. For returning adults, you’ll find it a little simpler with your age, but rest assured your patience will be tested in some moments. For the younger generation, though, it will bring a new, flamey lease of life into their gaming collection and by the looks of the sales, we can bet a lot of youngers are buying and loving this iconic original game style. The developers at Toys For Bob who worked on this reignited blast from the past deserve huge credit. Right from the get-go, you can feel the love that seeps out of the game, the tedious task of replaying and recoding each of the 3 games has been flawlessly executed in my eyes. The recreated and additional music that accompanies the game helps the word come alive as you dash and glide about. Picking up this game should be considered by anyone who likes beautiful level design in a timeless classic platformer. The game plays easier on your hands with the ability to use thumbsticks and integrations in the guidebook, along with everything else, has given us a truly well rounded, well loved and crafted platformer.